An area of low pressure will bring the potential for excessive rainfall to portions of Northern California through Saturday. 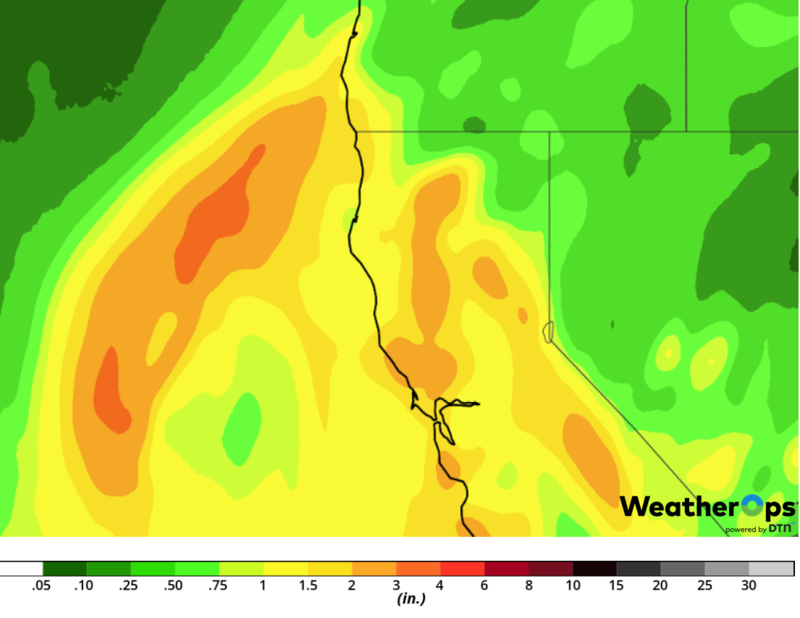 Excessive rainfall will continue across Southern California through Saturday as deep moisture moves across the region. Snow will persist through early Saturday from the Midwest into the Appalachians as moisture streams northward. An area of low pressure will bring snow to portions of the Sierra Nevadas through Tuesday morning. Fog will continue along the Texas and Louisiana coasts through Saturday morning. Elevated winds and seas will persist through early Saturday morning across the Gulf of Mexico as an area of low pressure moves through the region. Deep moisture is present over the region, and a strong area of low pressure is approaching from the west. This combination of conditions will allow for widespread shower and thunderstorm activity to move over much of Northern California this evening through Saturday. Widespread rainfall totals of 2-3 inches are expected with localized amounts potentially exceeding 4 inches. Since the ground across the area is not saturated at this time, there is a low risk for flooding and flash flooding across the region. As moisture continues to stream into the region today ahead of an approaching area of low pressure, conditions are favorable for moderate to heavy rainfall across Southern California beginning this evening. Widespread rainfall amounts of 3-4 inches are likely across the region, with locally higher amounts in excess of 5 inches across the Traverse Range. 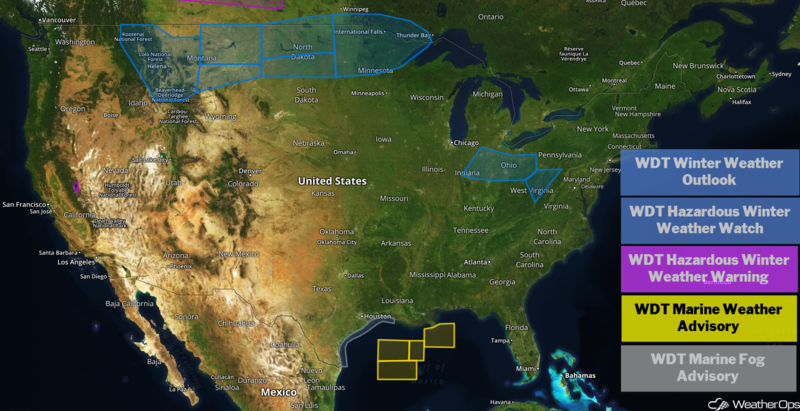 Not only is this a significant amount of rainfall, recent fires across the region create an enhanced risk for flash flooding as well as mudslides. 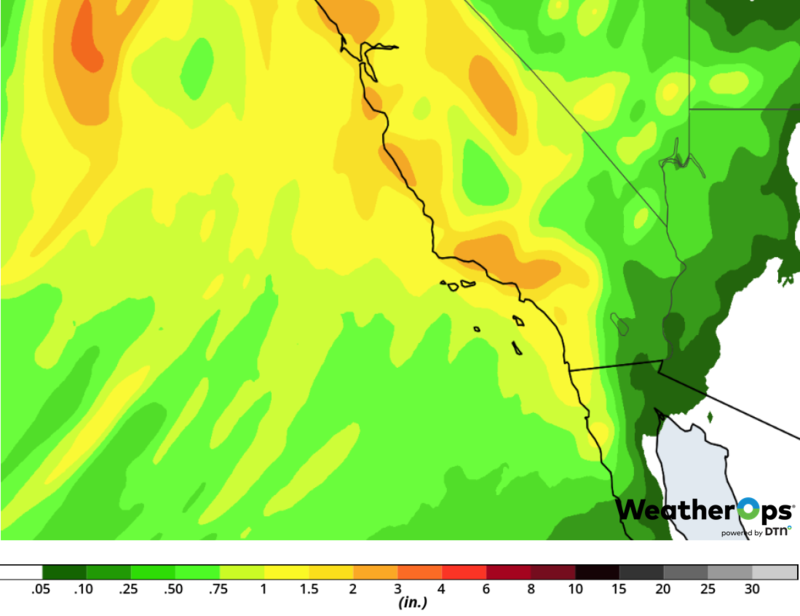 Current model guidance indicates that the heaviest rainfall will occur this evening into Saturday morning. Along with arctic air that is currently in place across the region, a brief period of snow is expected this afternoon into the evening as moist air streams into the region. Snowfall accumulations of 2-4 inches are forecast with locally higher amounts. The highest totals are expected across northern Indiana stretching into central Ohio as the system progresses southeastward. Precipitation will begin to ease in the afternoon hours. Light icing may develop over the Appalachians Friday evening into early Saturday morning. A prolonged winter storm is expected to impact the region beginning later this afternoon and continuing into early Tuesday. Accumulations of 3-5 feet are expected in the lower elevations and 4-7 feet above 7,000 feet. Additionally, wind gusts in excess of 50 mph are likely, with blizzard conditions and dangerous to potentially impossible travel expected. Winds initially should not be too strong but will gradually increase over the next few days, with the strongest winds occurring on Sunday and Monday. Surface observations and satellite data indicate that patchy areas of dense fog have been present along portions of the Texas coast this morning. While pockets of fog will persist, it will likely erode over the course of midday and afternoon hours. Visibilities will be less than 2 miles at times. However, the same atmospheric conditions that promoted this morning's round of fog are expected to linger into tonight and tomorrow morning, thus visibilities are likely to become limited once again. Elevated winds and seas will continue through early Saturday morning as an area of low pressure moves across the region. 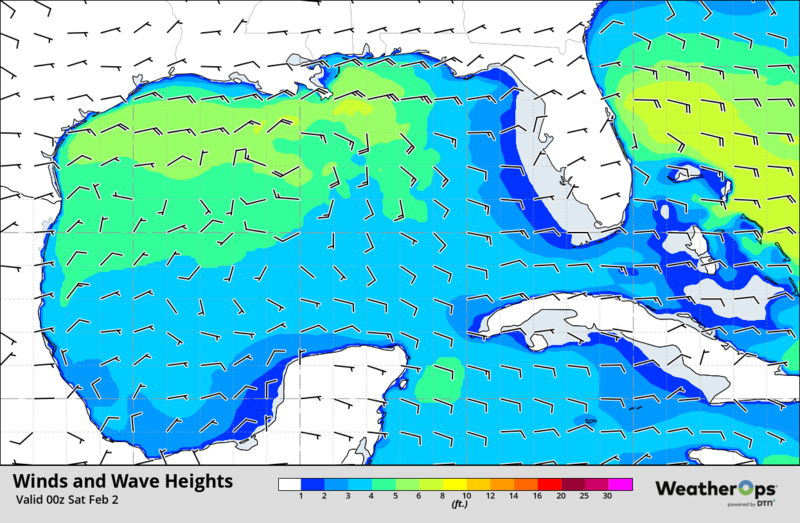 Winds will be easterly to east-southeasterly at 25-30 knots with gusts in excess of 40 knots. Seas will range 6-10 feet. As an area of low pressure system moves across the region, it will bring snow to portions of Montana and North Dakota. 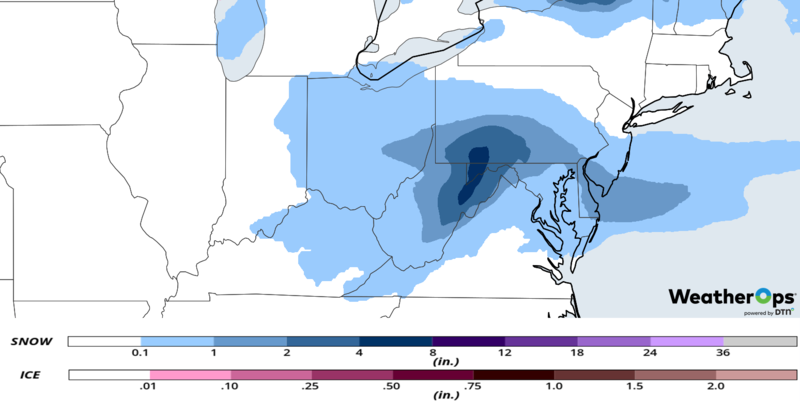 Widespread snowfall totals of 8-12 inches are expected, with locally higher amounts in excess of 15 inches. 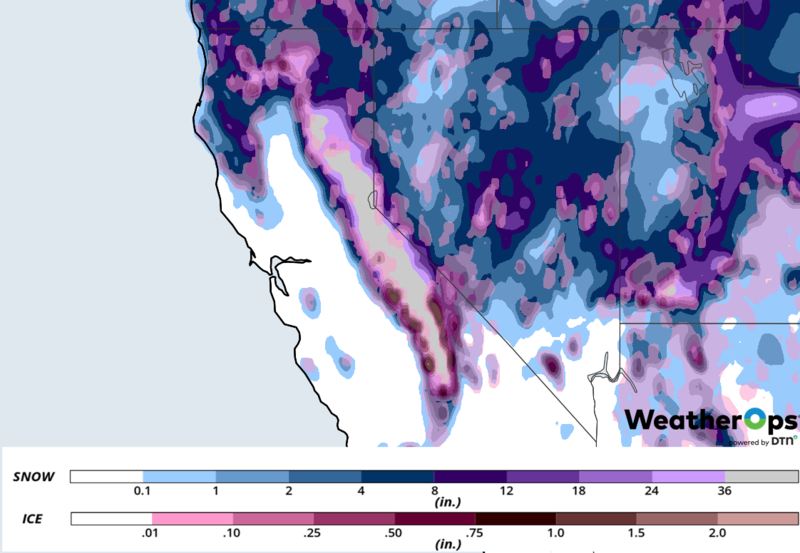 In the mountains, snow totals could exceed 24 inches. Wind gusts in excess of 35 mph are forecast with this system, resulting in the potential for blowing snow. This could result in reduced visibility. Use caution while driving, as roadways will likely become slick and hazardous. 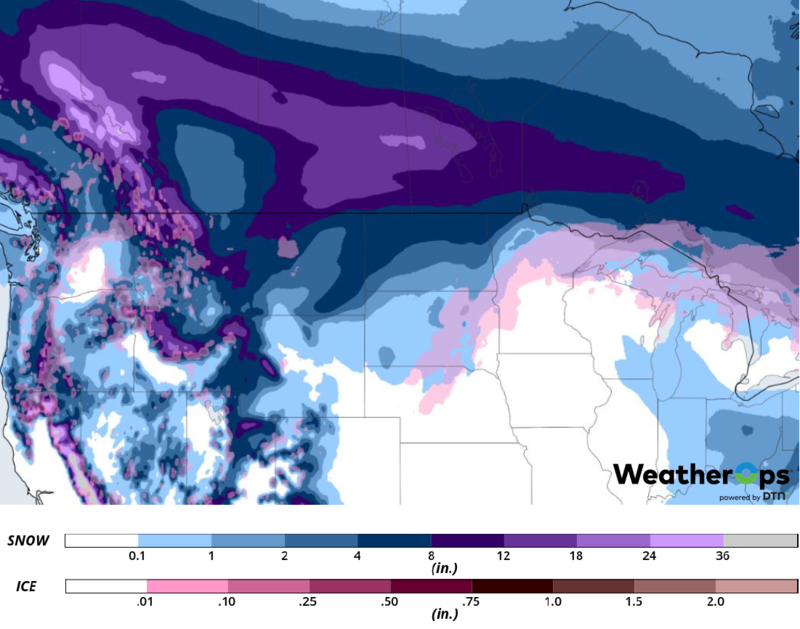 Snow will continue across the Northern Plains and spread into the Upper Midwest on Monday as the area of low pressure described above continues to move eastward. Showers and thunderstorms may extend from the Great Lakes into the Southeast. As this low continues to move eastward, showers and thunderstorms will move into the Northeast on Tuesday. Another round of light snow may develop Wednesday across the Great Lakes. A wintry mix is forecast across the Plains and Midwest on Thursday.